Neighbors of Palmer Square say they haven't been able to use a jogging path around the park since the park district dropped sand all over the path. 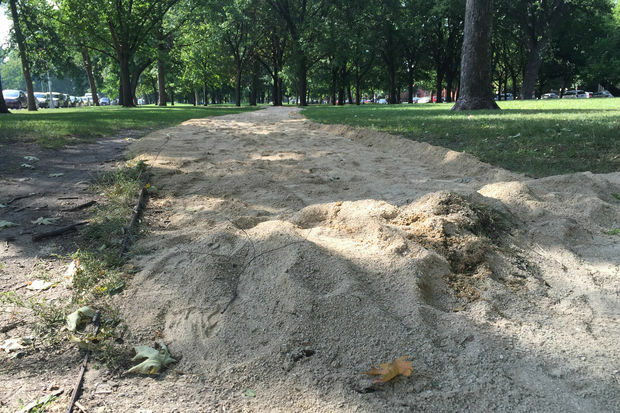 PALMER SQUARE — Mounds of sand that sat on the jogging path around Palmer Square for weeks has left runners unable to use the path, according to neighbors. The sand was initially laid out along the 1/2 mile path that circles the park to improve the surface, but no one came to smooth it out for weeks. During that time rain has caused the mounds of sand to harden, and created a dangerous path to run on, said neighbors such as Sandra Rodaligo. "Yesterday the sand had supposedly been smoothed out, but it's still a mess," she said. "It hardened in piles. You can't run on it. You can barely walk on it. You run on it, you risk breaking your ankle." The sand was dumped along the length of the path Aug. 26, but was not smoothed out until this week, according to neighbors. That smooth-job was too late, they say. "They basically dumped it in piles and left it," said Steve Heir, a longtime Palmer Square resident who is also the president of the Homeowners Association of Palmer Square. "It's embarressing." Heir and the homeowners association organized a group of twenty high schoolers from the neighborhood to come out with rakes and shovels Saturday to attempt to smooth out the path. Comment from the Chicago Park District was not immediately returned Friday. Hier said the Palmer Square Park Advisory Board originally proposed adding sand to the path earlier this year and planned to pay for the project, but the Park District stepped up and took on the task. Because of the situation, a new path has begun to form alongside the main path in the grass. "We are going to have a new jogging path," Rodaligo said. "I commend whoever was thinking to put new sand down, but it was not put down properly."